Hello and welcome to the all-breed Canadian Dogs Rescue Network. This is a tool designed for Canadians seeking information/resources on rescue groups and animal shelters across Canada. If you're a part of an organization with information/pictures on dogs available for adoption, please feel free to email me so that they may be posted on this site. Seeking for that special canine companion? Please look at the rescue groups/animal shelters' dogs first. They are in need of good, loving and permanent homes. There will be always "that" dog you're looking for somewhere in rescue and animal shelters awaiting for homes. Lastly, there is a Canadian Dogs Rescue mailing list that has various postings of available dogs needing homes. You may find your special family member there so feel free to subscribe to this all-breed Canadian Rescue List!! 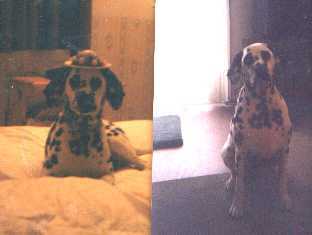 Dalmatians Dalmatians are my favorite breed and I have to voice something about their plight. There are too many abandoned, abused and dumped Dalmatians out there. Here goes...They're a delight to be around, what with their endless expressions and mischief. Dalmatians are a LOT OF WORK and require a lot of patience, commitment from its human family. DON'T GET ONE UNLESS YOU KNOW THIS BREED!!! are determined to make their own minds. Dalmatians also shed 24-7, not twice a year like the myth says. They also can have health problems such as skin problems, kidney stones, urinary tract infections or allergies and Deafness is a high chance in Dalmatians. This does not mean I advocate putting the deaf dalmatians to sleep. They have every right to life. Links to Other Worthwhile Sites! Please take the time to explore the sites. They have proved to be very useful in my search for rescue information! There are dog postings as well on some of the sites. Rescue Contacts by Province: An excellent resource to find information!! Email: Debbie Phone: 250-768-5621 If you know of more links that should be added, please feel free to email me at All-Breed Canadian Dogs Rescue Network Also, feel free to send me your postings (pictures are okay too, make sure its in jpeg format)at the email addy above.